Perhaps we will look back on the time before February 6, 2019 as B.O. and after that perhaps turning point date as A.O. Because Before Otto was acquired in trade from the Washington Wizards, the Bulls were a dispirited, stumbling 12-42. But After Otto was acquired in a trade for Bobby Portis and Jabari Parker, the Bulls are 3-2 with Friday’s 110-109 victory over the Orlando Magic, the second back-to-back wins of the season, a period of six games in which the Bulls have outscored opponents by double figures combined and averaging more than 116 points per game. The Bulls Friday got 25 points, 11 rebounds and the tying and winning free throws with 1.5 seconds left from Lauri Markkanen, 22 points and a team-best six assists from Zach LaVine including the defensive stonewall on Orlando’s last play and Otto Porter with seven of his 17 points in the fourth quarter including a pair of pressure baskets in the last four minutes. "I think we are starting to get into a little bit of a rhythm and we are starting to have a little bit of fun out there, too," said LaVine. "I think all of our games should elevate. We are sharing the ball a lot more. I think the shot attempts are down, but the efficiency is up. And if that results into wins, I will take that all day. We are not going out there and just saying, ‘You know, we will get better next year.’ This is the time to really jell tougher and get better." Did someone wearing a Bulls jersey mention fun? Maybe this does become some sort of dividing line in at least recent Bulls history. No, this wasn’t a victory over the Boston Celtics, whom the Bulls host Saturday and who beat them by 56 last time, or league-leading Milwaukee whom the Bulls host Monday, or some Western Conference team that celebrates a lot and has had reason to. Still, the Magic had won seven of eight to get into playoff position in the Eastern Conference. 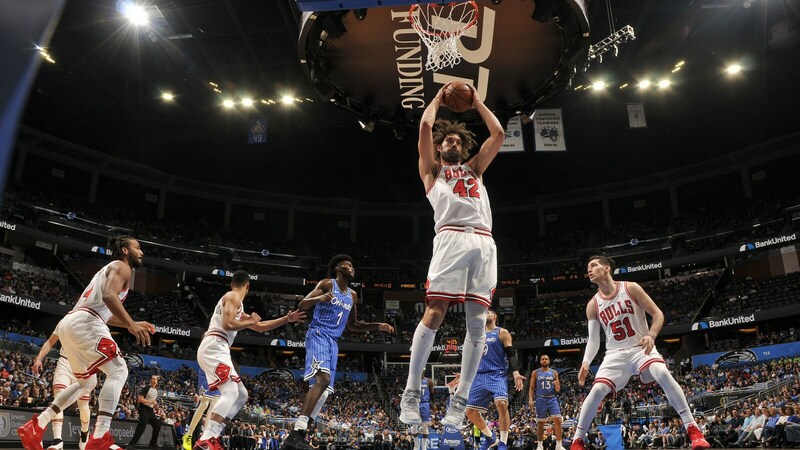 It wasn’t the most impressive victory for the Bulls with Aaron Gordon going brain dead and fouling Markkanen on a three-point attempt with barely more than a second left, Orlando’s best free throw shooter, D.J. Augustin, missing two with 34 seconds left in a tie game and Orlando, in the league’s top 10 in free throw shooting missing 11 free throws in the game. "I thought it was a great NBA game," said Bulls coach Jim Boylen. "I thought both teams threw punches (23 lead changes and 17 ties). Both teams had deficits they had to overcome and it was a highly competitive, good game." And even with the Bulls new Big Three combining for 64 points, 20 rebounds and 12 assists and 12 of 22 on threes, it seemed like the Bulls threw away a dozen or more points by going long stretches ignoring LaVine even as he had nine points in 57 seconds at the end of the first half and at one point had 21 points on just eight shots. And Markkanen, averaging 25 points this month with his eighth double/double in the last 10 games, repeatedly failed to finish strong enough and had four of his shot attempts blocked. A little more oomph and a bit more awareness and perhaps the Bulls would have been blowing past Orlando like they were on Thunder Mountain. "Zach LaVine, that kind of game is what I envision him being, efficient, six assists, he makes five threes, two steals. I thought Zach was great," said Boylen. "Lauri was great. RoLo (Lopez with a putback with 8.7 seconds left for a two-point lead) made a big play at the end. The 38-point third was huge for us. Good team win. Out of the frying pan into the fire tomorrow night." But at least the Bulls finally seem to be cooking instead of just being roasted most nights. They’ve still got the fourth poorest record in the NBA, though now just four games behind Atlanta for the fifth worst and drawing well clear of bottom feeders New York, Cleveland and Phoenix. All of that will be debated when the season concludes with the May draft lottery drawing. But scoring at least 100 points in 20 of the last 21 games and with four of the last seven losses by five points or fewer and two others also in single digits, the Bulls are in their best stretch in more than a year. And breaking through a bit by finally being able to close out a victory in a fourth quarter with 10 lead changes. The Bulls are 15-44 and Orlando dropped to 27-33. "It was a lot of back and forth basketball," agreed LaVine. "We kept making tough shots, Lauri, KD (Kris Dunn) made a big shot, Otto made a couple big shots, and Rolo at the end with the incredible putback. I am glad we closed out the game. We are making a shot and they are making a shot. It felt like five minutes where it was just trading baskets, so it is a fun game when you play that way as long as you end up with the win." 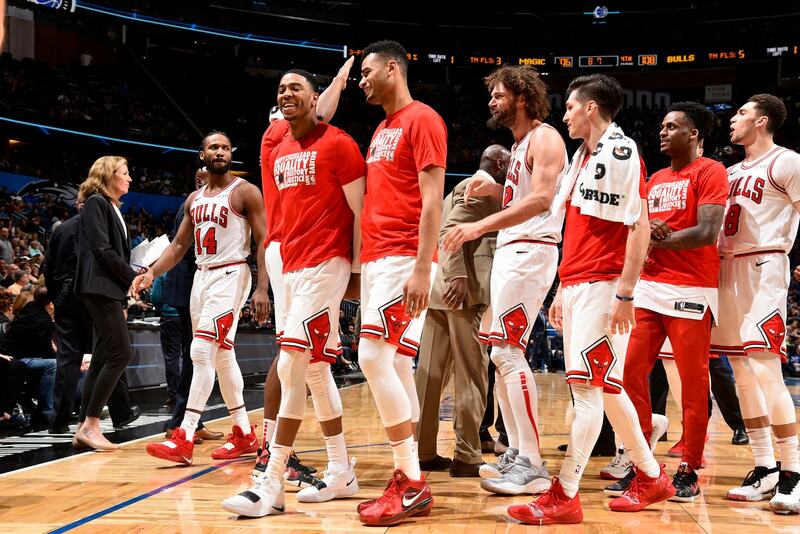 It was, indeed, a frantic and frenetic close, the sort of denouement in which the Bulls this season mostly have produced sad endings. The drama began with a 99-98 Bulls lead with 4:17 left in the game on a pair of Lopez free throws. The seemingly disposable big man is in perhaps the best offensive run of his career with 18 points Friday, his fourth straight of at least 17. After Nikola Vucevic made a short jumper, Porter followed with a corner 20 footer for a 101-100 Bulls lead with 3:44 left. "Otto makes timely shots. He has been in tough situations before," LaVine noted. "He is a straight up professional and we are loving him." Back came Orlando with All-Star Vucevic following his own miss for a score. Dunn then made a nice floater, though it was another cautious game for him. Ryan Arcidiacono in reserve doesn’t provide much offense, but had a terrific sequence of defensive plays in the first half drawing a pair of charges and fighting off a huge mismatch in the post to save six sure Magic points. Evan Fornier for Orlando came right back with a 16 footer for a 104-103 Orlando lead with 2:59 left before LaVine and Jonathan Isaac exchanged misses. LaVine was scoreless in the fourth quarter with three misses, but the Bulls constantly put him in tough shot situations without enough movement. It’s why the Bulls had just 18 assists and were bailed out by excellent shot making by LaVine, Markkanen and Porter. Imagine if they learn to swing the ball for better shots with those shooters. Porter then made an intrepid step back three with 2:03 remaining for a 106-104 Bulls lead. Fornier answered with a drive to tie the game with 1:45. LaVine and Markkanen then missed back to back, and it looked like another failure to finish for the Bulls. But Augustin shockingly gifted the Bulls the two free throw misses. And then Boylen got the jump on Magic coach Steve Clifford by staying with Lopez. "I didn’t see that they put Lopez back in the game and we ended up too small out there and we ended up giving an offensive rebound up," Clifford admitted. "That was as big a possession as the (three-point) foul, as big a possession as the missed free throws." The Bulls came out of a timeout with 32 seconds left substituting Wayne Selden for Dunn and staying with Lopez. The isolation was for LaVine in the tie game and he dribbled until about four seconds on the shot clock and attempted the right wing 22 footer. There could have been more movement and a better shot. And LaVine did wave off Markkanen setting a screen earlier in the possession. Markkanen then came out again to set the screen for what had to be a quicker shot. 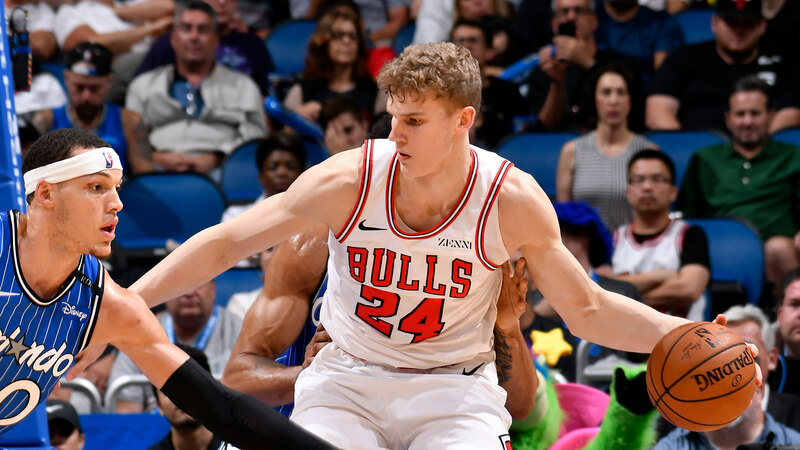 Markkanen was pinned inside on the miss, but he went up and tipped the ball to Lopez, who grabbed it over the smaller Magic front line and dropped the ball in for a 108-106 Bulls lead with 8.7 seconds left in the game. But there was still much to do as, understandably, the defensive communication with newcomer Porter isn’t set. He called for Markannen to switch on a down screen for Fornier out of the timeout. Markkanen didn’t and Fornier popped open over Vucevic for a three and 109-108 Orlando lead with 6.3 seconds left. This loss was going to be tough. Selden threw inbounds to Porter moving into the frontcourt. Porter dribbled past a high Lopez screen into the middle of the floor with the clock moving under four seconds and seemingly with no shot. Markkanen, who was waving, popped out to near the top of the circle. Porter threw back to him. Markkanen caught the ball with three seconds left in the game. Markkanen took a quick jab step to get an open shot and lose Gordon and then moved to his left. Gordon went for the jab step and tried to recover, crashing into Markkanen as he shot. It was an obvious foul no one among the Magic even challenged. Markkanen needed to make two of the three free throws for the lead with a second and a half. Markkanen afterward said the last time he was in a similar position was for a Pac-10 title against Oregon and missed both. Didn’t think about that, he claimed. Then Markkanen stepped up and bricked the first off the back of the rim. "Just wanted to make it a little interesting," he joked. Markkanen then swished two for the lead and LaVine stayed down and kept Fornier from even getting off a shot in time as the game ended. It was LaVine at the end of the first half with three consecutive three pointers, all degree of difficulty shots that probably saved the Bulls after Orlando appeared to be pulling away with a 50-42 lead. LaVine’s run made it 53-51 Magic at halftime. The Bulls would be outrebounded, but lead 19-4 in fast break points with just eight turnovers despite the multiple ballhandlers. "If LaVine doesn’t make those three, really all three of them unguardable threes, we’re up like 10,11 at halftime," said the Magic’s Clifford. "They have three very talented offensive players and they all made plays when they needed to." It looks like it might even become a habit.